Shell leverages the Salesforce Platform’s robust report and dashboard tools to strengthen portfolio intelligence and facilitate data-driven collaboration. 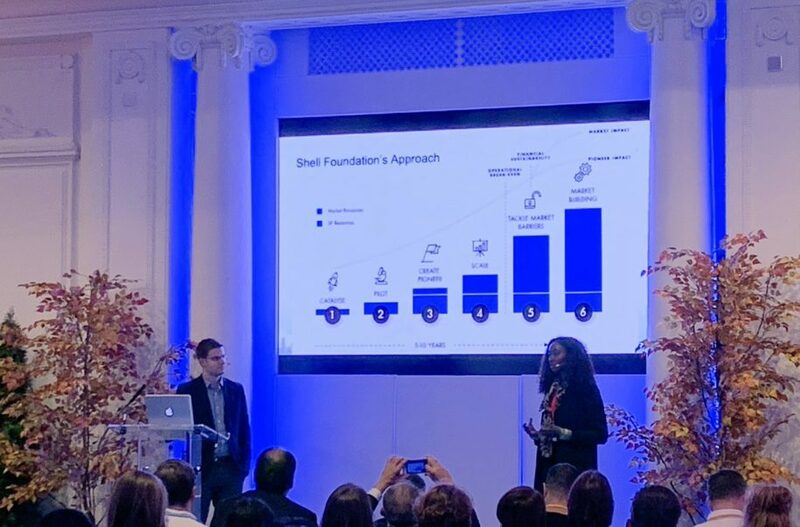 Vera Solutions Co-Founder and CEO, Zak Kaufman, took the stage with the Shell Foundation’s Government Relations & Social Impact Manager, Adedayo Bolaji-Adio, to share how the grant-making organisation uses Amp Impact to monitor social and environmental impact reporting for 50+ companies. Adedayo presented Shell’s monitoring and evaluation evolution—from primarily tracking progress against KPIs to the Foundation’s new Enterprise Hub, an online portal built on Amp Impact that grantees use to report impact data to the foundation. Amp Impact provides the Shell Foundation with out-of-the-box functionality on Salesforce to strengthen portfolio management and easily understand grantees’ social ROI. What’s up next for the Shell Foundation’s Enterprise Hub? Adedayo noted that the foundation will continue to build out the platform into a full investments management system as well as dive into the next phase of data analytics. Stay tuned! In this fast and furious session, four companies competed to deliver their best product demo in under three minutes. It was no easy competition, with GiveClarity, Docusign, and Fonteva all putting forth impressive demos, but Vera (once again) was voted Demo Jam winner by the audience, following a lightning-quick demo of Amp Impact’s main features for portfolio management and impact measurement. Each of these apps live on the Salesforce AppExchange, allowing for full interconnectivity and integration into any Salesforce system. We’d love another opportunity to test our demo skills. Schedule a demo of Amp Impact. Ryan Guillot of London School of Economics (LSE) International Growth Center (IGC), Matt Harrison of Homeless Link and James Measey of Compassion in World Farming discussed leveraging Salesforce’s AppExchange to solve business challenges. While IGC and Vera are still in the initial phase of a grant management system implementation, Ryan encouraged the audience to think holistically through the necessary tools required to maximise their organisation’s data solution. Many2Many, Form Assembly, and Conga Composer are some of the additional apps that will integrate into the IGC grants management system, while Compassion in World Farming highlighted its use of Clarity Banking, Campaign Monitor and Cloudingo. Since launching in 2017, Amp Impact is now being used in over 30 countries. View on the AppExchange. 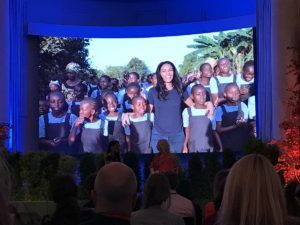 Salesforce.org is accelerating the impact-first discussion both by leading by example and also by helping NGOs to lead with their own programmatic impact. Who better to share on this topic than our partner from the Aga Khan Foundation (AKF), Joanne Trotter, Global Lead for Results and Learning. From Kenya to the Kyrgyz Republic, AKF brings together human, financial, and technical resources to expand opportunity and improve the quality of life of some of the world’s most marginalized communities across six key areas while tracking their impact on their Global Reach System, built on Amp Impact. As one of the earliest Amp adopters, AKF has helped to shape the product, defining indicator management needs to make it even more friendly in low-bandwidth settings. Alongside Salesforce.org’s Eric Barela and Brian Komar as well as Economic Change’s Heather Black, Joanne shared AKF’s continual journey towards improving data reliability. We’re grateful for AKF’s leadership in the sector and excited to see more organisations following their example. Learn more about how AKF is using Amp Impact to track 80+ indicators across 400+ programmes globally. Connected Nonprofit was the perfect storm of nonprofits seeking technical solutions to program management and CRM needs. We saw a flurry of eager minds seeking demos of our products at the Vera booth – Amp Impact, Many2Many, and PROMISE3. The day closed with a room of technology enthusiasts ready to take their programme management, impact measurement, community engagement, and fundraising to the next level. For those of you that stopped by our booth, thanks for sharing your passions, curiosities, and data needs. Check out 7 nonprofits setting the bar for Salesforce-based M&E. We’re eager to see whose story we have the opportunity to join next. So, what has us walking away from CNPC London wide-eyed and inspired? To wrap an eventful day, international model and philanthropist, Noëlla Coursaris Munsunka, inspired the audience through her own story of impact—returning to her home country of the DRC after many years to help promote gender equality through the creation and promotion of a school for girls. Alongside Salesforce.org’s VP of Programs, Charlotte Finn, Noëlla encouraged each attendee to draw inspiration from their own passions and use their own unique platforms to unlock the potential for global change. In order to transform the social sector, we must continue to integrate our ideas and passions—to think about health, education, childhood development, economic inclusion, environmental sustainability, and food security on a broader scale. After a day engaging with hundreds of impactful UK-based nonprofits, we’re encouraged by the appetite to utilise technology to propel us forward. More and more organisations moving off spreadsheets and harnessing the power and flexibility of Salesforce as a platform for CRM, M&E, supply chain management, and programme management will continue to unlock a culture of transparency and accountability across the social impact sector. We’re humbled to be a part of it. Thanks for the ultimate gathering place, Salesforce.org! We’ll be back next year. Want to discuss how your organisation can take advantage of Salesforce for impact measurement and programme management? Drop us a line – we’d love to hear about your data needs!